The cell. 3. Cell membrane. Proteins. Atlas of plant and animal histology. Proteins are responsible for many of the functions carry out by membranes. The protein-lipid ratio may vary in different membranes, but it is roughly 1:40 in number of molecules and 40 % in weight, which means that membranes usually have a lot of proteins. The proportion of proteins may be even higher in those membranes with strong metabolic involvement such as the inner membrane of mitochondria. About 1/3 of our genes code for membrane proteins. Membrane models depicting the molecular organization have been modified to reflect the importance of proteins as essential elements for the membrane structure and function. The basal model to build from is the fluid mosaic by Singer and Nicholson. In this model, proteins are scattered in the membrane and can move freely. However, nowadays, the interactions of proteins with both intra- and extra-membrane molecules that restrict the lateral movements have been included in the model. Furthermore, data from atomic force microscopes suggest changes in the models of membranes to include the proportion of proteins and the physical space they occupy (Figure 1). Proteins are numerous and diverse, specifically distributed through the cell membranes. They can be classified in different ways. Regarding their function, they can be receptors, enzymes, adhesion molecules, channels, transporters, pumps, membrane handlers, and many others. Some proteins may be included in more than one category. Regarding on how proteins are arranged in membranes, there are two main groups of proteins: integral and associated. Integral proteins are permanent components of the membrane. They may be transmembrane proteins, proteins spanning just one monolayer, or proteins that are chemically linked to a membrane molecule. Figure 2. Types of transmembrane proteins. There are transmembrane proteins, such as glycophorin, with an amino acid chain that spans once the cell membrane, whereas others, such as many receptors, can have several crosses. In these examples, the amino acid chain intermingled among the fatty acids shows an alpha helix arrangement. 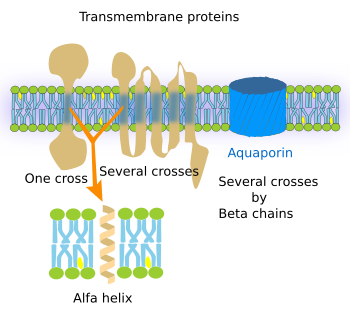 Aquaporin is also a transmembrane protein forming a channel with several crosses, but the amino acid chain among fatty acid shows a beta organization (modified from Pollard et al., 2007). Transmembrane proteins show three molecular domains: two hydrophylic and one hydrophobic (Figure 2). For instance, plasma membrane proteins have an extracellular, an intra-membrane and a cytosolic domains. The intra-membrane domain contains sequences of hydrophobic amino acids that are located among the fatty acid chains of the membrane lipids, whereas the extra and intracellular domains contain hydrophilic amino acids. Transmembrane proteins proteins are mostly synthesized in the endoplasmic reticulum and distributed to other cell membranes by vesicular traffic. Some transmembrane proteins have amino acid sequences that span the membrane one time, whereas others do it more times, up to 7 crosses. Although most transmembrane proteins work alone, many of them need to be associated to other transmembrane proteins to perform their functions working as oligomeric groups. The functions of transmembrane proteins are diverse. a) Integrins, cadherins, and selectins are adhesion proteins. b) Pumps and ion channels generate and modify ion gradients between both sides of the membrane. For example, to produce ATP, or to exchange ions, such as calcium, sodium, and potassium. c) Transporters make possible large molecules to cross the membrane. For instance, they allow glucose to get get into the cell crossing the plasma membrane. d) Receptors enable cell communication by binding specific ligands, such as hormones, growth factors, neurotransmitters, and others, and transducing these signals into intracellular downstream molecular events. This can be done because transmembrane proteins have two hydrophilic domains, located at either sides of the membrane, which are connected by one or several intramembrane domains. For example, after the recognition of an extracellular signal, a molecular rearrangement occurs in the transmembrane protein that is transmitted to the intracellular domain, which in turn causes a cytosolic molecular process, sometimes ending up with changes in gene expression. Figure 3. Main types of peripheral membrane proteins: integral and associated. From left to the right: proteins with a part of the amino acid chain spanning just one monolayer, proteins linked to glycolipids, proteins linked to fatty acid chains inserted among the membrane lipids, proteins associated to the membrane lipid heads by electric affinity and proteins associated to hydrophilic domain of transmembrane proteins (modified from Alberts et al., 2002). There are integral proteins which are not transmembrane proteins. Some of them have part of the amino acid sequence inserted in only one of the monolayers of the membrane, so they have one intramembrane domain and one external domain (Figure 3). If they are in the plasma membrane, depending on the monolayer where they are integrated. The external domain may be cytosolic or extracellular. 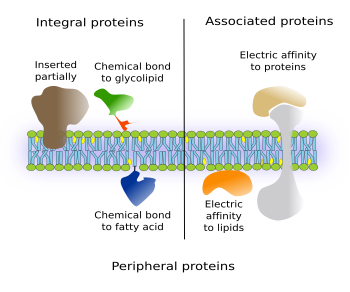 Another type of integral proteins includes those chemically anchored to other membrane molecules, mostly glycolipids or fatty acids inserted among the membrane lipids. In these cases, the entire protein is either cytosolic or extracellular. Most commonly, they are bound to GPI (glycosylphosphatidylinositol). These proteins were discovered in the seventies of the XXth century and today we know hundreds of them in all eukaryotic cells studied so far. They include, for example, enzymes, adhesion molecules, and components of cellular layers in protozoas. It is interesting that in some some cases, like the adhesion protein N-CAM, the same protein may be transmembrane or GPI-linked protein depending on mRNA differential splicing. Associated proteins are not permanently joined to membranes, i.e. they are not integral proteins. Instead of chemical bonds, electrical interactions, such as van der Waals forces, keep these proteins stuck to the hydrophilic surfaces of membranes (Figure 3). These forces are weak and proteins may switch between be attached to or detached from membranes. Associated proteins are hydrosoluble. Zhao W, Tian Y, Cai M, Wang F, Wu J, Gao J, Liu S, Jiang J, Jiang S, Wang H. 2014. Studying the nucleated mammalian cell membrane by single molecule approaches. PLOSone. 9 (5):e91595.